In System Preferences, Mac lets you determine which system to use to start up your computer. Click the gear icon on the Dock to open System Preferences and then click Startup Disk. Mac OS X displays the version numbers of each system and the physical drives where each system resides. The Mac Startup Disk pane within System Preferences. To select a start-up disk, click the desired start-up drive from the scrolling icon list. Select the Network Startup icon if you want to boot from a System folder on your local network; typically, such a folder is created by your network administrator. If you’ve set up a Windows partition on your hard drive using Boot Camp, the folder appears with a Windows logo. If you’re planning on rebooting with an external Universal Serial Bus (USB) or FireWire start-up disk, that disk must be connected already, powered on, and recognized by the system before you display these settings. 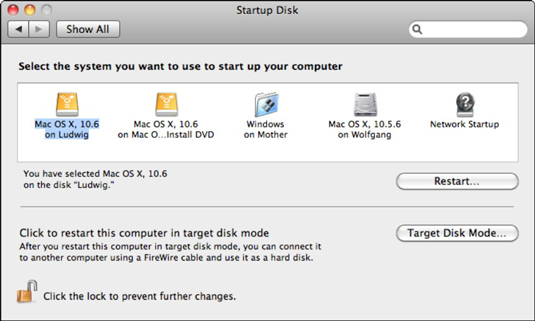 Click Target Disk Mode to restart your Mac as a FireWire external hard drive connected to another computer. (This comes in especially handy when you’re upgrading to a new Mac and you need to move files between the two computers. If for example if the video card decides to stop working, you can make an updated backup copy of the ailing Mac’s hard drive before you sent it off for repair.) You can also restart your Mac and hold down the T key to invoke Target Disk Mode. After you click a disk to select it, click the Restart button. Mac OS X confirms your choice, and your Mac reboots.